Kingsthorpe Indoor Bowls Club player Connor Cinato has qualified for the Scottish International Open Championships, which will be played from November 5, 2016, in Perth in Scotland. He qualified for the event following matches at the City of Ely IBC in September, and he joined five others in this singles event at Blackpool Newton Hall IBC on Sunday, the winner of which was to be rewarded with a place in Scotland. Game 1: Cinato beat Allan Ramsey of Scotland 1-1 in sets (6-5 & 5-10 shots) with a 2-1 win in the tie break. Final: Cinato beat Paul Maynard (his Pairs partner referred to in Item 4) from Foxhill IBC 1-1 in sets (4-9 & 7-6 with a 2-1 win in the tie break. Cinato will now play well known Welsh International Jason Greenslade in the first round in Perth on November 5. CONNOR CINATO has also qualified for the World Bowls Tour (WBT) event at Potters in January, 2017, following the qualifying event at Dolphin IBC in Poole in Dorset last weekend. The Kingsthorpe IBC bowler almost qualified again for the singles too. In the Pairs, Cinato joined forces with Paul Maynard, a former Northants player who moved home and now plays out of Foxhill IBC in Aylesbury. Their progress to qualification was as follows, play being of two sets with a tie break if needed. Their opponents are both former England Internationals, so this very tight win was very commendable, with a tie being achieved in the first set 5-5 shots when Cinato drew the shot bowl with his last wood, and in the second set with one end to play the scores were level at five shots each. Cinato again drew the winning shot bowl for the 6-5 shots win. Final: Maynard & Cinato beat Ben Coldrick & Steve Knight (Midglos IBC) 1-1sets (7-6 shots & 2-8 shots) & 2-0 in the tie break. This was clearly a very tough final match to qualify, with the score in the first set 6-5 against with one end to play, which they won by two shots to take the set. The second set went very much in favour of the Gloucestershire pair after three ends of play as Maynard and Cinato were denied further shots from being 2-1 up after three ends. The tie break, however, went the way of the Kingsthorpe/Foxhill combo, as they took both ends to qualify for Potters. They will play at 9.45am. on Friday, January, 13, 2017, against opponents not yet finalised. In the singles, Cinato was narrowly ousted in the quarter-final by the eventual winner of qualification, James Rippey, of Falcon IBC in Chelmsford, Essex. He lost the match by the merest of margins on a tie-break. With the last wood of the match having been bowled, Cinato was asking for one shot, when Rippey’s second shot bowl fell and tilted Cinato’s shot bowl against the bias, for James to take shot and match. 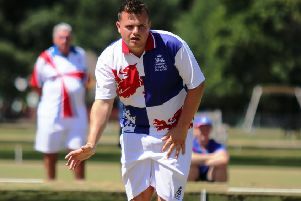 NORTHAMPTON West End bowler Jamie Walker has been named in England’s senior international team for the British Isles Bowls Council Senior Men’s International Series to be held at Belmont BC in Belfast next July.